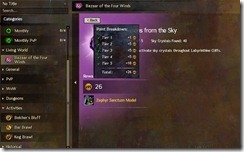 An overview of the GW2 account achievement rewards and achievement UI revamp to be introduced with the Bazaar of the Four Winds patch. Account achievement rewards will be released this patch. This feature was hinted at for several months so it is good to see it finally released. 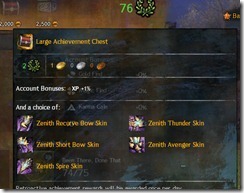 For every 500 achievement points you earn, you get an achievement chest as a reward. 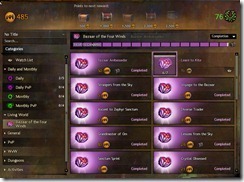 The following is a reward table that was given (may not reflect live servers). You do not spend any achievement points to get those chests. They are automatically given to you and do not require purchase. Weapon/Armor skins, once unlocked, can be used infinite times and directly withdrawn from the achievement window (sort of like HOM skins). A whole selection of Zenith weapon skins will be available, not just the five shown below. You can pick only one skin to unlock per achievement chest. 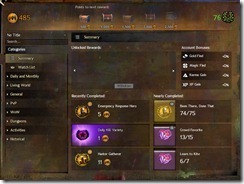 Rewards will be given for retroactive achievement points but you will only get 1 chest per day (i.e. if you have 7k achievement points and stay there, you will need to wait 14 days to get all the chests at 1 chest per 500 points). The achievement UI interface was redesigned to reduce clutter and improve usability. Summary window: The first thing you will notice is the summary window. 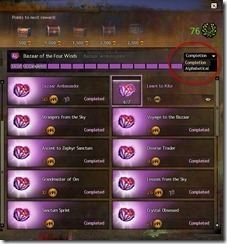 From here you can see your account achievement rewards, recently completed achievements, and nearly completed achievements. Watch List: This is where you can quickly monitor your tracked achievements. 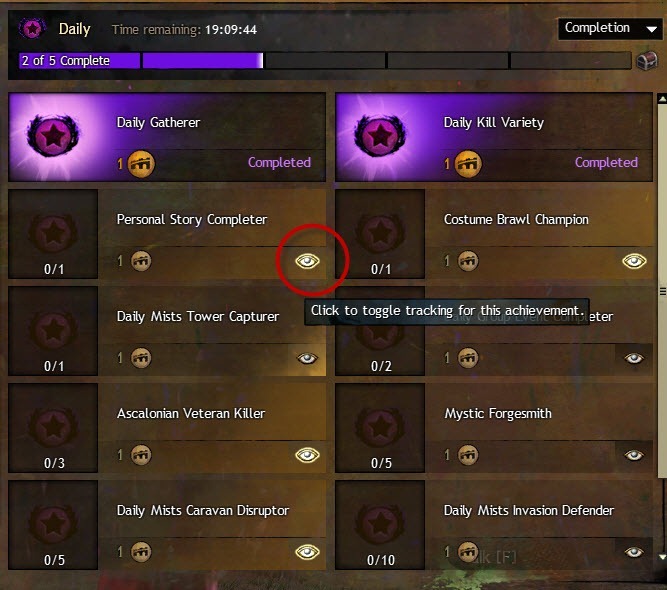 Any achievement can be tracked by simply selecting the eye icon. This will place that achievement onto the Watch List page and also place it on the top right corner if there is room. From the Watch List page, you can also quickly remove any achievements from tracking. 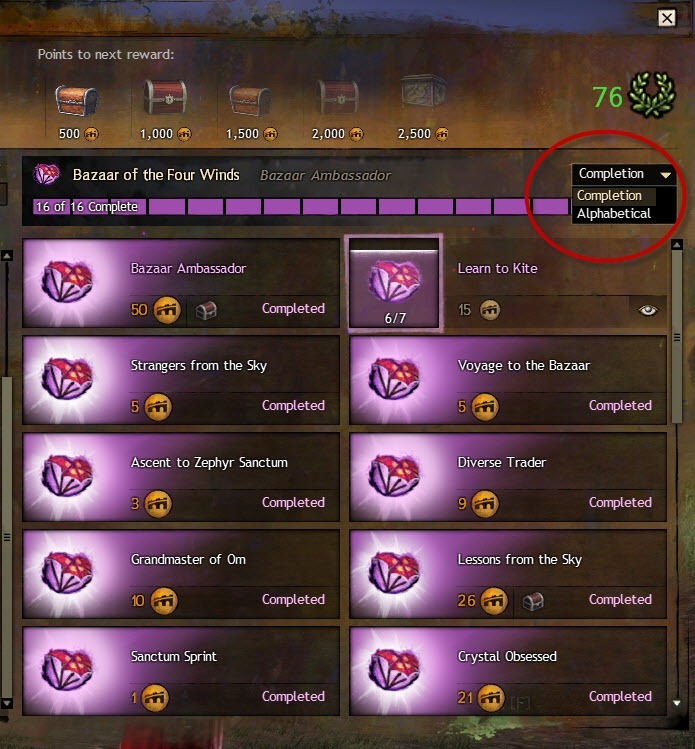 Living World: This is where you can find the achievements for the most recent patch. Each patch will have its own unique achievement icon. 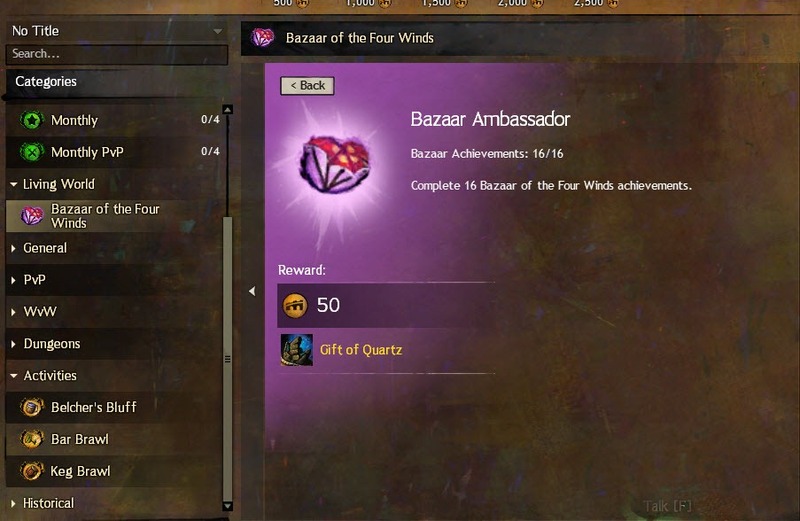 This is the window for the Bazaar of the Four Winds achievements. Activities: Here you can find achievements for the various mini-games. Belcher’s Bluff, Bar Brawl and Keg Brawl are listed here. On live servers you should also see Crab Toss under it. Note that Bar Brawl is not actually available yet. Achievement details: Clicking on any achievement will bring you to its own page. Here you can find the rewards given for this particular achievement and a tabulation of the achievement points for the various tiers. Achievement sorting: Under any achievement category you can sort the various achievements by Completion or Alphabetical. 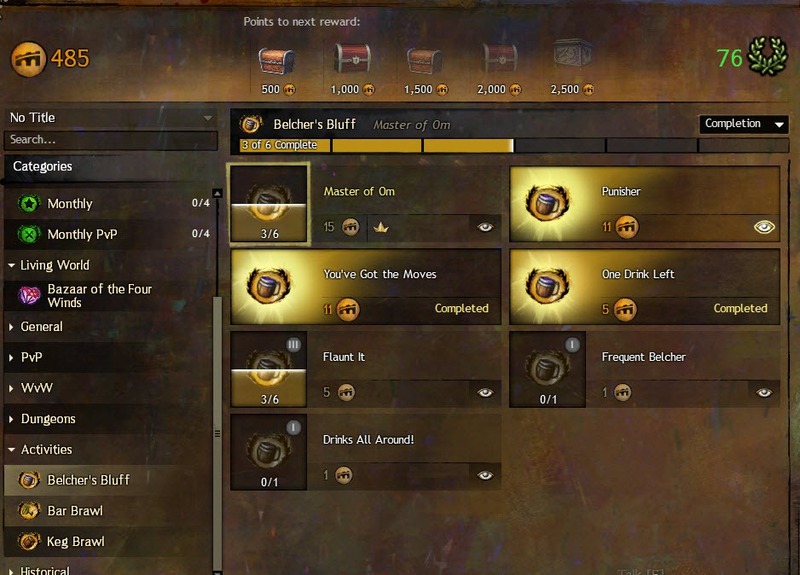 so you buy this chests for your achievment points or they just unlocked, when you reach certan point? They become unlocked and you get a popup on the right side of your screen. that’s it? Nothing extra for points above 2500? There is, the achievement window shown was a mock up and doesn’t have everything. Another question – do you know if the perma bonuses are cumulative? for e.g. at 2500 you have a total of 2% MF gold find and karma gain? Achievement window only went up to 2500 for us so we couldn’t see. The devs are aware there are people with 11-12 k achievement points so these people will be rewarded accordingly. Are they adding the old achievement skins like the flower or dragon wing backpiece in to the skin gallery that can be applied to all chars? 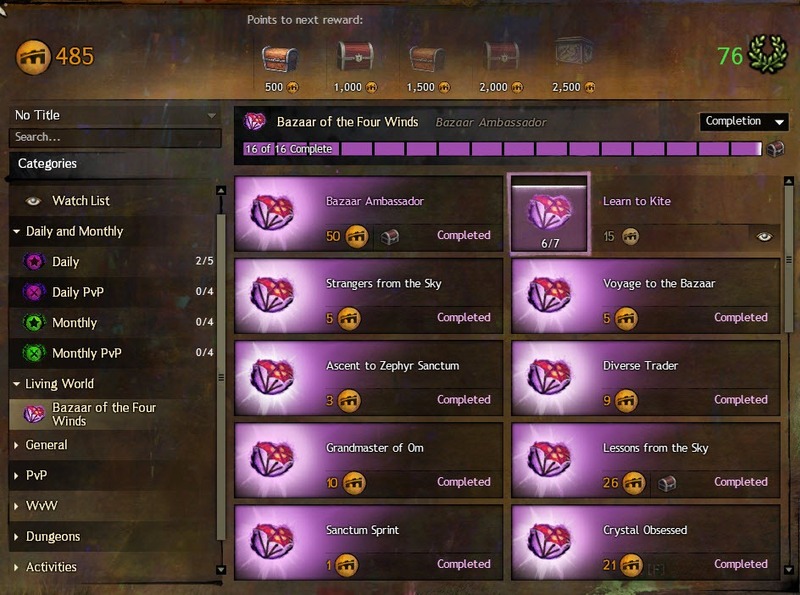 I am not sure, the achievement window they showed us were missing those event achievements. 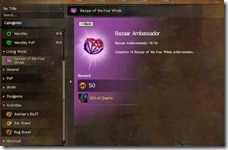 Any indication if they plan to add more rewards to the achievement point system down the line? Also, you say that “keg brawl” isn’t available yet. I believe you mean Bar Brawl. Thanks, Dulfy! Will these be retroactive? Or for points accumulated after the patch? I.E. Will I get skins on login? Or am I going to need to grind? They are retroactive but you may not get them on day 1 since retroactive rewards are given once per day. Thanks for all you do Dulfy. 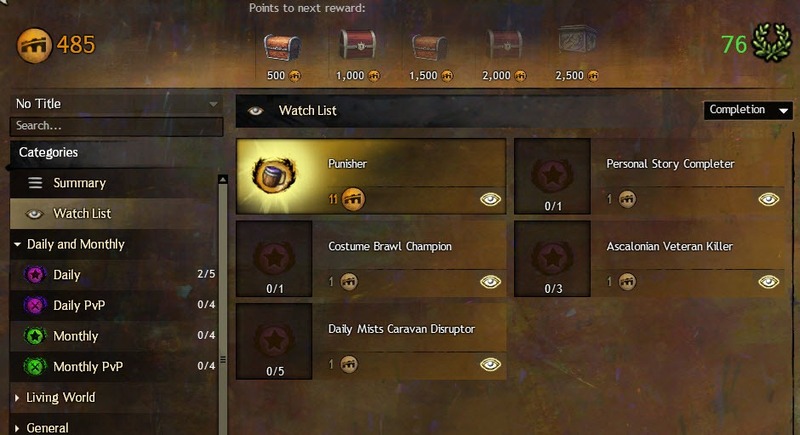 Any new title add into this new achievement system? There are titles associated with Belcher’s Bluff and Bazaar of the Four winds if that is what you are asking. I believe he meant titles every x achievement points and such, which looks like we’re not getting. Thanks for your work! I have a question: They said they will also be doing something with currencies dealing with WvW and Spvp. Did you see anything about that? Nope didn’t see anything related to that. The weapons skins are also account-wide? I mean, once I unlock, lest say, the staf… will I be able to re-use that skin over and over like with the HoM rewards? Yup, exactly like HOM rewards. Thx for the prompt response. Wait, it says in the guide that “You can pick only one skin to unlock per achievement chest.”. So when I hit 1000 points, I can only choose one weapon skin from the five, and that’s it? Or would I get to choose another one to unlock at 1500, 2000, and so on until they’re all available? Yes so at 1000 you can pick 1 skin out of the 5 for example and then at 2000 you can pick another skin out of the 5 to unlock etc. You can keep getting unlocking them as you get more achievement points unless of course there are some new rewards at a higher tier that you want. Yes for now that is what it looks like. However keep in mind that we havn’t seen beyond 2500 yet so you may get weapon skins every 500 points and then armor skins every 1000 points at higher tiers. Does it occur to anyone else that dumping all that “free” gold into the game is going to drive up the cost of pretty much everything in the Trading Post? Gold find just means any cash mobs drop. Considering they drop paultry sums I don’t think an additional 1% is going to cause economic upheaval. No I personally doubt it, you’re talking about 1 to 5 G max per unlock here, it’s nothing that you can’t make in a couple of CoF runs with extreme ease. And certainly not a spammable affair per account. 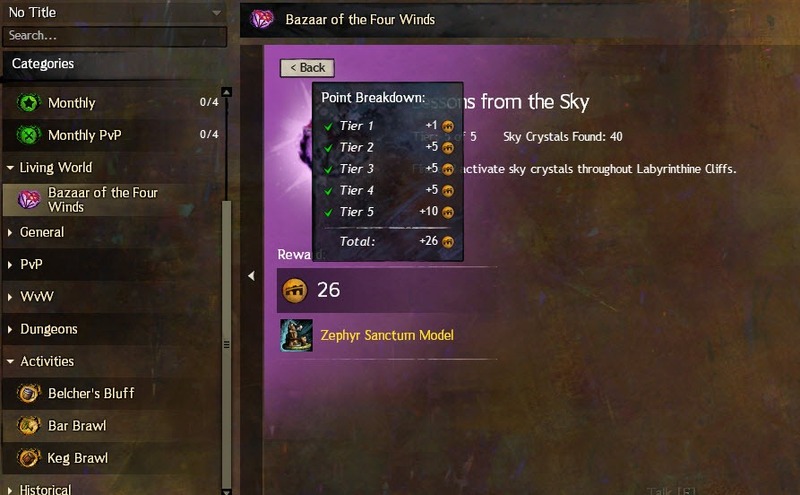 If anything, they are most useful to the GW2’s noobies who are either not versed in farming gold or simply haven’t hit 80 yet. Makes no difference to me and many others. … This is bugger all, anyone who is at 3k+ points will know how to farm cof anyway and being able to get 10-14gold in an hour there with no effort other than time spent at any point is going to be more than the tiny extra bits of gold here. They are either not shown here with this version of the achievement window or they are unlocked at higher milestones/tiers. Dulfy… can you confirm that we get ALL rewards of a specific tier. I.E. for 1000 achievement points you get the gold, the Laurel, the +MF bonus AND a choice of (1) skin? Last chest is at 2,5k AP? That is not the last chest, it is just the last chest you see in the preview. So only the 1k/2k box has the skins and the other ones don’t? just making sure. Meh….lately it seems i can’t even read T.T Ignore the armor skins question. 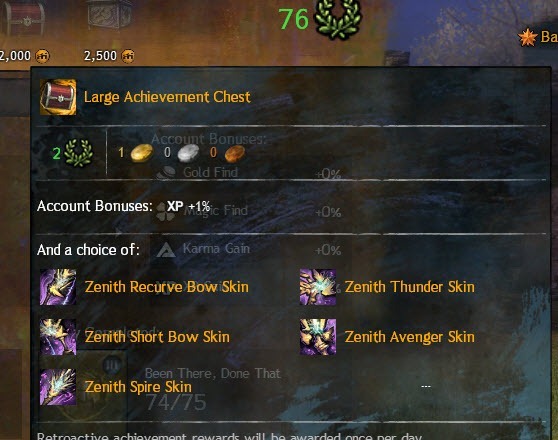 So does the “achievement-points” get deleted when you “buy” a chest or do you have still an overview of your points that you had collected to see how progressed your char is? TLDR You do not spend any achievement points to get those chests. They are automatically given to you and do not require purchase. yeah sorry epic fail. 😀 I was just watching the vid. “Rewards will be given for retroactive achievement points but you will only get 1 chest per day” Well that is wierd, why not just give all chests when patch goes live? I don’t think it would be as bad as expected, the gold they are giving is rather tiny, same with laurels… I doubt it would influence the economy for more than 2 days at best. Did they separate out the tracking of achievements and the tracker for daily/monthly completion? That is the change I want to see. I hate having to go in and untrack everything just to get a nice sorted list of daily/monthly tracking progress. They need to be separate, and I hope they did so with these changes. Please tell me they did? Crabtoss isn’t working on my server, completely locked out. It was removed in the dragon bash patch, it will be back later in another patch. Can be saw the paths we have already done in the dungeons? Can the armor,weapon skin use in pvp? Is there a 100 point chest? What about the achievement points i already have. I have more than 3k points. Do they count? I got today a 100 point chest will i get the others as well? 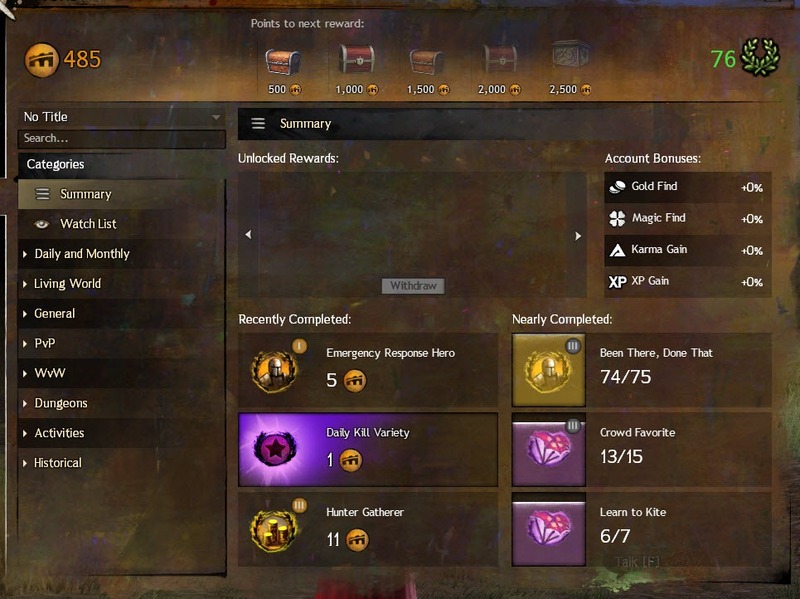 Yes, you get 1 chest every day until the rewards reach your current achievement point total. Do we know which reward level we receive armor skins at? Where is Bar Brawl game? if you got al the chest wil the next day start you then from the begining over and over again?? no, it will continue from where it left off. If i unlock an armor, does it unlock for other character as well? yup all characters in your account. So you get the reward for (example) 1000 points only once? i wonder what we’ll get after 10k points? i’m nearly there. They are used for purchase armor and weapons in the world vs world vendors. Go to your home world map and the vendors are behind you when you enter the map.